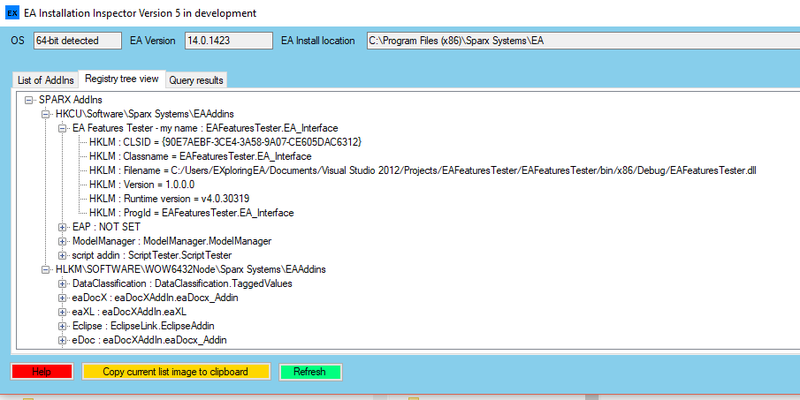 One of the most useful tools I have probably produced for use with EA is my EA Installation Inspector. Although less so nowadays, there was a time when I was forever wondering why my AddIn wasn’t working. It was several years ago that I produced the first release and have periodically added a few enhancements. With this I have added some information to main form. But also felt I could improve the presentation of information to help AddIn developers get a better overview using a treeview of Sparx Addins information as illustrated below. However, often the hard to find issues are those where there is a mismatch of something, such as the wrong class being called, and although careful inspection of filenames may resolve a search of the registry (not necessarily quick) can help expose the error. As the searches usually relate to known AddIn classes it is straightforward to use information in the AddIn keys to initiate a query with context sensitive menu. In addition, a user can define their own searches, e.g. entering a class name or filename. The queries execute in the background allowing the user to continue using the tool for other tasks. Furthermore, queries are queued with the results being presented in their own tab, as well as being output to a unique log file. Although not yet polished this version is available for download from either my EA Tools Wiki http://tools.exploringea.co.uk/index.php?n=EaInspector.Development or https://github.com/EXploringEA/EAInstallationInspector where the source code is also available. I’ve also added some of notes on Installers and EA Installation Issues on my EA tools wiki, and always interested to know of any other issues with installing EA. I hope you find the new features useful. This entry was posted in All on 03/09/2018 by exploringea.